The HAMC membership comprises both choristers and associates and always welcomes new members. We have about 80 members: over 40 choristers and a similar number of associates; most members live in North West London. Men, of all ages and backgrounds, are welcome as singing members – whether they belong to other choirs or have not sung since leaving school. It is not necessary to be able to read music. The important quality is a love of singing and the desire to do so well in aid of good causes. All supporters are welcome to join our associate membership. The full choir rehearses most Tuesday evenings at 8:00 pm in the Belmont Room, Harrow Arts Centre, Hatch End, HA5 4EA. +Google-map If you would like to come along to try us out, we would love to meet you. Ideally, contact us in advance, so we can have a folder of music ready for you. We perform about 12 concerts a year, in and around North West London, Hertfordshire and Buckinghamshire, raising money for good causes in those areas, throughout the UK and world-wide. Short tours that enable us to perform further afield are organised approximately every two years. In addition to the Full Choir, we have an Ensemble of about 16 choristers, who practise twice a month; once, prior to the main rehearsal on a Tuesday evening and once, on a Thursday lunchtime. The Ensemble performs in smaller venues and is open to any chorister, who can spare the additional time involved. The Full Choir or Ensemble are available for concerts, social functions (weddings, birthdays, funerals etc. ), corporate events, community events/festivals, club events (e,g, WI meetings, U3A talks etc. ), hospital/nursing home visits and are always willing to consider new experiences. We perform alone or with other choirs, orchestras and/or soloists. 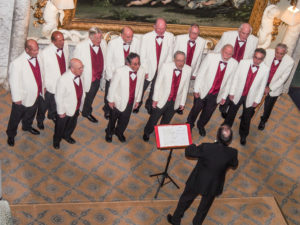 We can provide a customised choral programme from our varied repertoire for whatever kind of event you have in mind.We also provide talks about the choir. Contact our Concert Manager (Tel.020 8868 2228 email: booking.harrowAMC@gmail.com), if you would like to book us. Price on application.